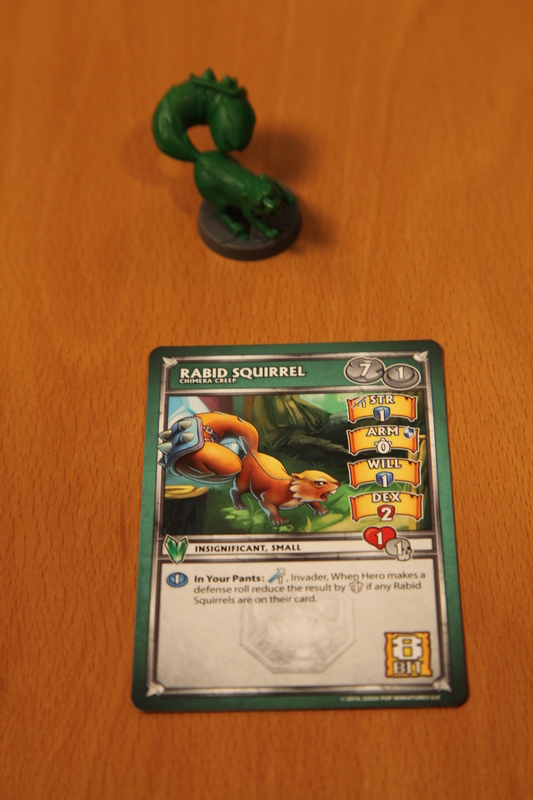 Published by Soda Pop Miniatures. Released in May 2015. For 2-6 players ages 12+. Plays in 3-4 hours. Review copy provided by publisher. 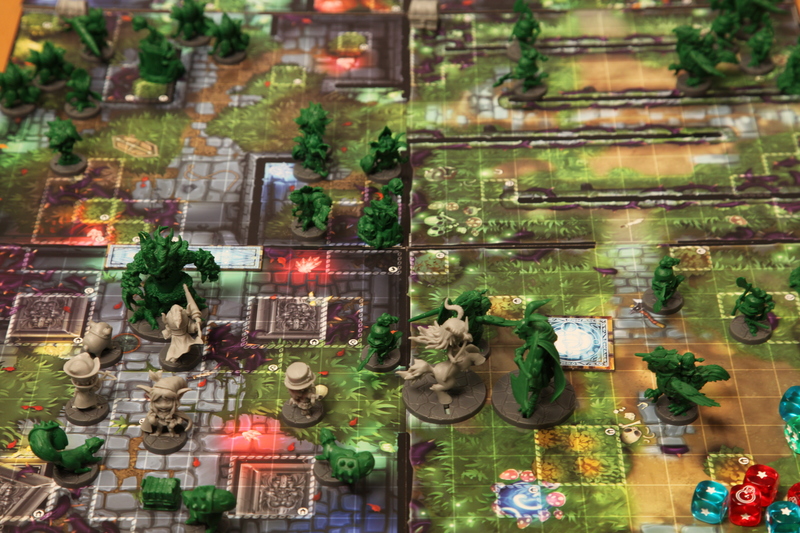 Even in the highly saturated market for dungeon crawling board games, there was never much that mirrored or paid homage to dungeon crawling, hack and slash video games. 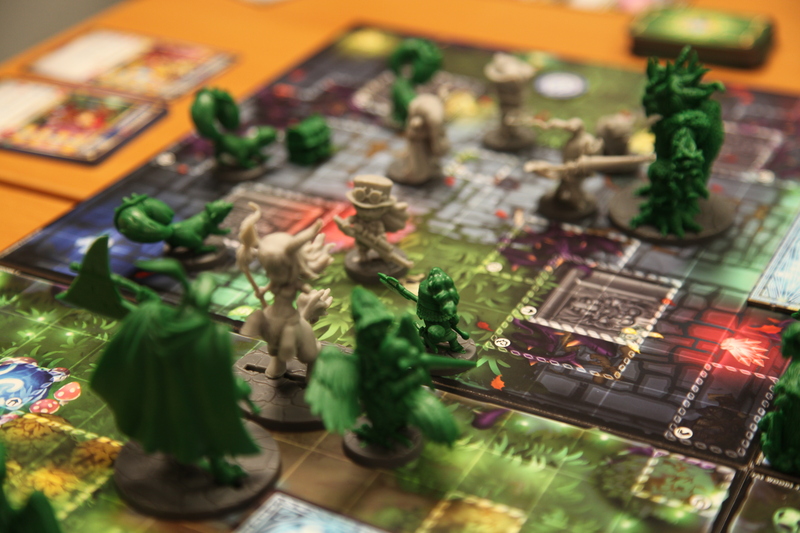 2011's Super Dungeon Explore filled that niche, and the successfully Kickstarted expansion-which-is-also-the-second-edition, Forgotten King is now loose in the world. Combining the best of lighthearted, Gauntlet-esque slashing with loot collecting, enemy-crushing, and Soda Pop Miniatures' signature chibi art style makes for a fun game, if it can drag at times. It's playable in two modes, one controlled by an enemy player versus heroes, called classic mode. The other, called arcade mode, has enemies controlled by a deck of cards. Both modes are fun, though arcade mode is often easier for experienced players and classic mode plays better when you add custom twists and house rules to the game. Packed with nice, pre-built miniatures and high quality cards, the basic game box is a treasure trove. 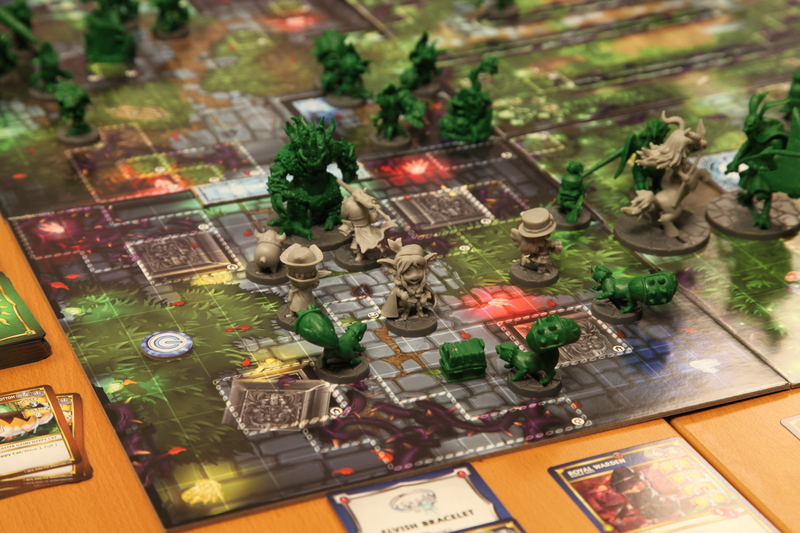 The dungeon tiles are double sided and allow for the maximum number of players, as do the explore decks, dice, and allotments of tokens and treasures. There are also figures and stats for the maximum number of heroes. There are 40+ monster figures in the box as well, and that's quite a few, but sadly there's no indication that the number of monsters and spawns you get is only enough to properly play a three player plus one dark consul game. With a bit of simple fudging you can still play with up to five heroes, but you'll have to substitute out miniatures as you go and you won't *quite* be playing the game properly - but you probably won't notice. 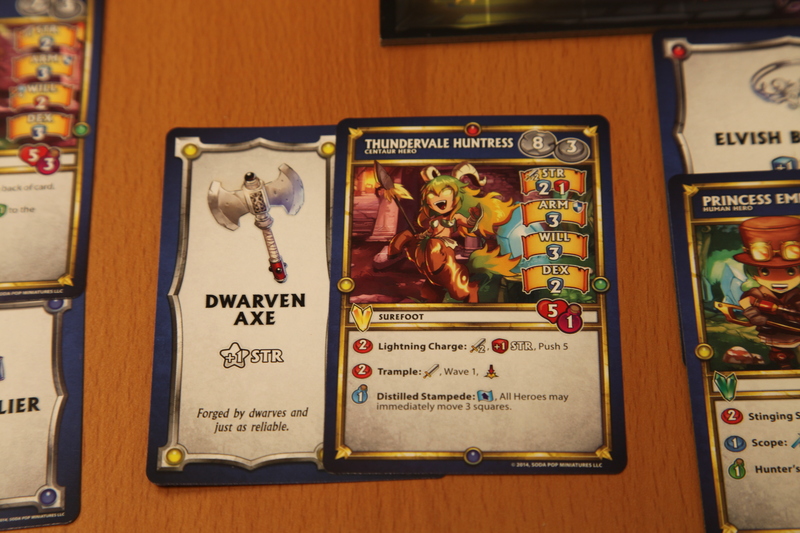 Of course, a variety of expansions are available to add more monsters, heroes, and the like to the game, as well as a conversion card pack that upgrades the stuff from old Super Dungeon Explore game and expansions into the new mechanics. 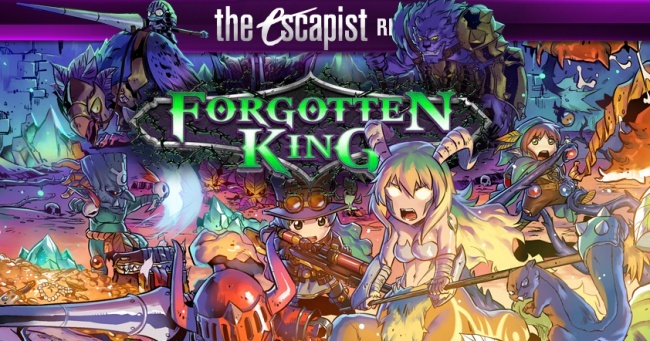 Forgotten King owes much of its basic tactical play to 2011's original Super Dungeon Explore, but it does revamp much of the metagame elements that make the game tick. 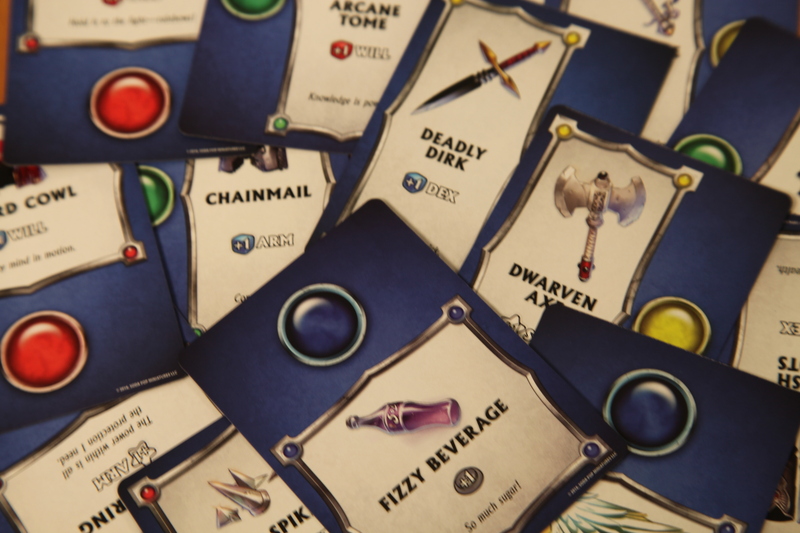 Much like Soda Pop published miniatures game Relic Knights, Forgotten King uses an alternating activation system, easy to learn unit cards, and a randomized collaborative setup process. 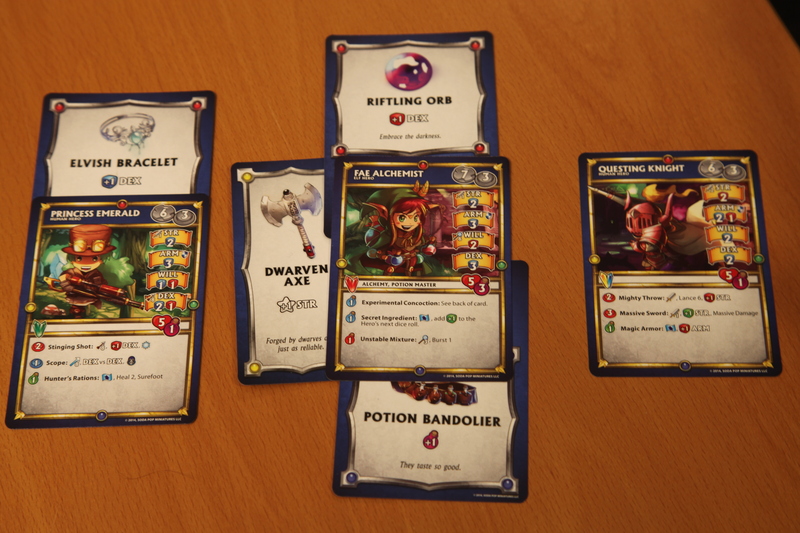 Each round a player will take a few actions like moving, attacking, opening chests, and drinking potions. 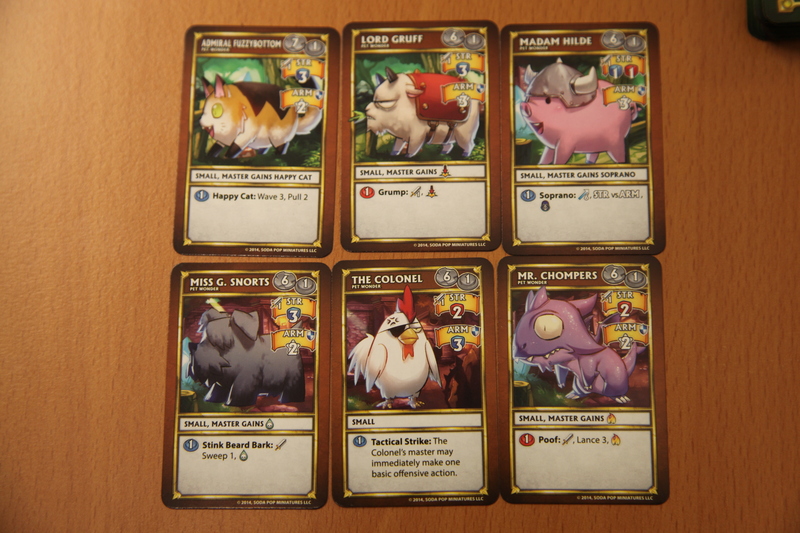 Then the turn passes to the monsters, and depending on game mode either the dark consul player or the arcade deck says what some monsters do. Then the turn passes to another, different player, and back to the dark consul until everyone has acted - then you start the whole thing over. 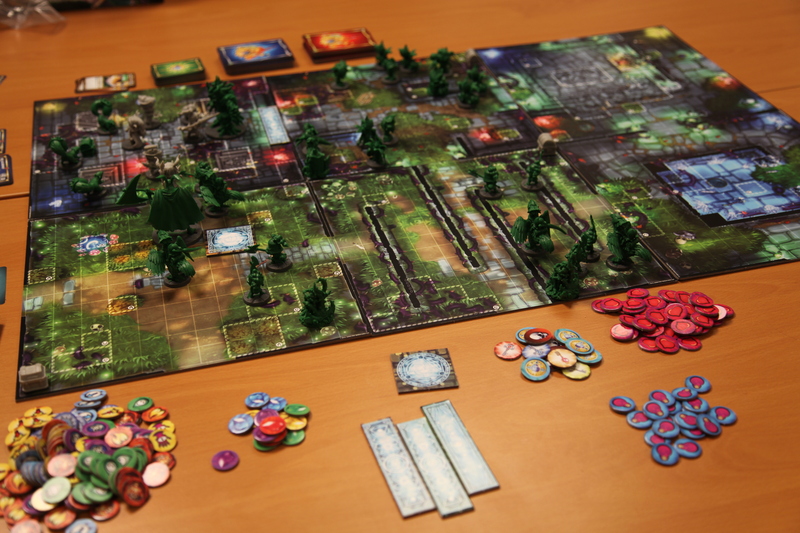 The players' goal is to defeat spawn points, minions , and mini-bosses to gather loot and eventually become strong enough to kill the Dungeon Boss. The Dark Consul's goal is to defeat all the players. That game plays out in a pretty classic-feeling tactical, grid-based combat game, with the added pleasure of collecting loot. You have hit points, stats, and special powers. All of those involve rolling dice, counting stars, and trying to get more stars than the other critter's defense roll got it. If you get more stars, you deal a point of damage. Easy. The custom dice also have symbols like potions, which you or your teammates can use to buff up, or hearts, which will give you some health back if you roll them while you're on the offensive. 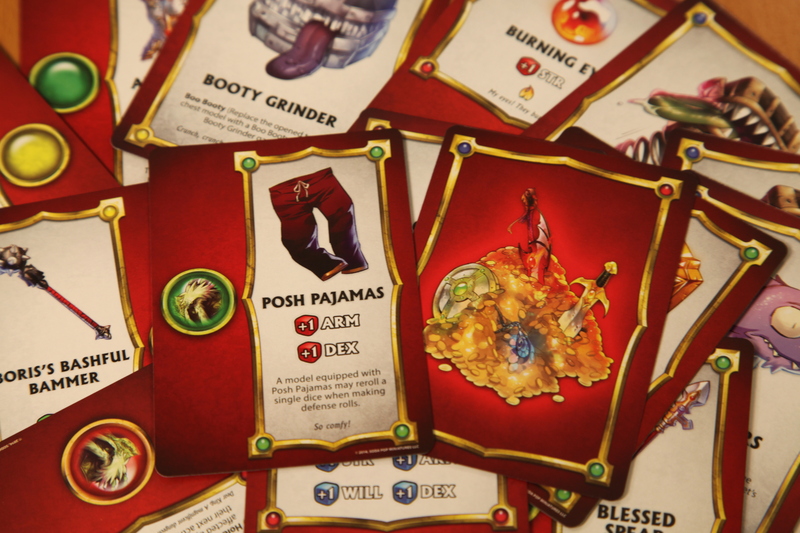 Loot cards and the more powerful Treasure cards are the means of progression in the game. You get loot for killing monsters, treasure for opening chests and killing mini-bosses. 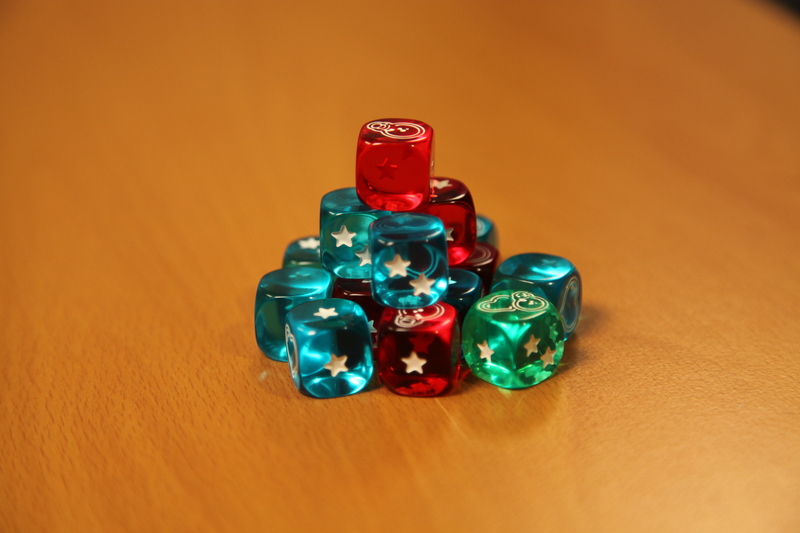 Loot might give you a bonus star on an attack, Treasure might give you a powerful green dice, or a few less powerful blue or red dice. Each character has four loot slots, which can only have one item in them, and the loot cards literally slide partially under your character card on those slots to make understanding the system as simple as possible. In any given round, you and the other players will maneuver your heroes into positions where you can do as much damage as possible to the monsters while taking as little damage as possible yourselves. The monsters, meanwhile, will either be going on a freewheeling arcade mode rampage or the dark consul will be maneuvering them to keep you from getting at the spawn points and whittle you down at the same time - or sacrificing a whole turn of movement to respawn every monster they've lost from that point. Often, players will strategically risk themselves to kill a spawn point and deny the consul another round of monsters - taking a bit of extra damage from the inevitable mini-boss spawning right on top of them, but maybe speeding the game to a faster conclusion.